"Love is the most important thing in the world," said Yogi Berra. "But baseball is pretty good, too!" Baseball is pretty good and if you ask Houston Astros fans, they might say baseball is pretty darn great! 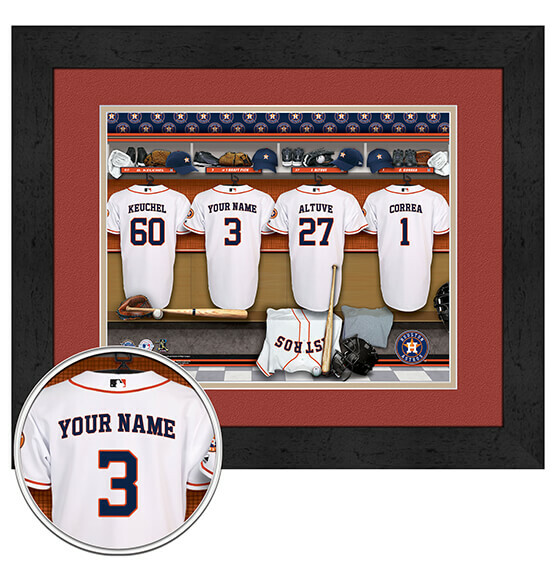 This Personalized Locker Room Framed Wall Art allows you to add any name (up to 12 characters) to the back of an Astros jersey for an MLB baseball gift they will never forget. With its sleek black frame, high-quality glass and a ready-to-hang sawtooth piece for simple mounting, holidays, birthdays or anniversaries will never be the same again for those Astros fans in your life!